"Letter writing is probably the most beautiful manifestation in human relations," John Graham wrote to his wife Elinor in 1958. "In fact, it is its finest residue." So begins Liza Kirwin's More Than Words, a stunning collection of artist-made illustrated letters mined from the Smithsonian Archives. The book features over 90 works of mailable artwork in the forms of thank you notes, love letters, rambling descriptions, holiday greetings and simple how-do-you-do's. The personal details regarding aspects of life, business, family and love, are accented with images, filling in the literal and figurative blanks to communicate what words sometimes cannot. "In a letter to his wife, painter Walt Kuhn writes, 'One should never forget that the power of words is limited,'" reads the books introduction. Indeed, it's more than obvious that for many of the artists included in the book, images are not flowery adornments, nor secondary means of communication in any sense. For artists like Andy Warhol, Ray Johnson, Rutherford Boyd and Gladys Nilsson, it appears that images are at the core of interpersonal contact, an instinctual and necessary mode of human connection. Every letter represented is dated and described, providing readers a brief and intimate glimpse into an artist's most personal creations. Unlike the artworks that hang on museum walls or live in artist catalogues, these visual creations were never intended to leave their recipients' grasps. As you might expect, each artist letter is as unique and vibrant as the respective maker's well-known works. In a written invitation to artist Ben Shahn, Alexander Calder infuses his message with his inimitable style of stark shapes and bold color, turning a map to his home into an abstract composition, somewhat reminiscent of a flattened version of the mobiles for which he's so well known. The 1949 message, despite its seemingly offhand creation, maintains a sense of harmonious equilibrium that almost hovers above the page. Frida Kahlo's note is at once sensual, tortured and vulnerable -- par for the course for the beloved surrealist. In 1940, following her divorce from Diego Rivera, she wrote to her friend Emmy Lou Packard thanking her for taking care of Rivera during an ailment and working as one of his assistants. 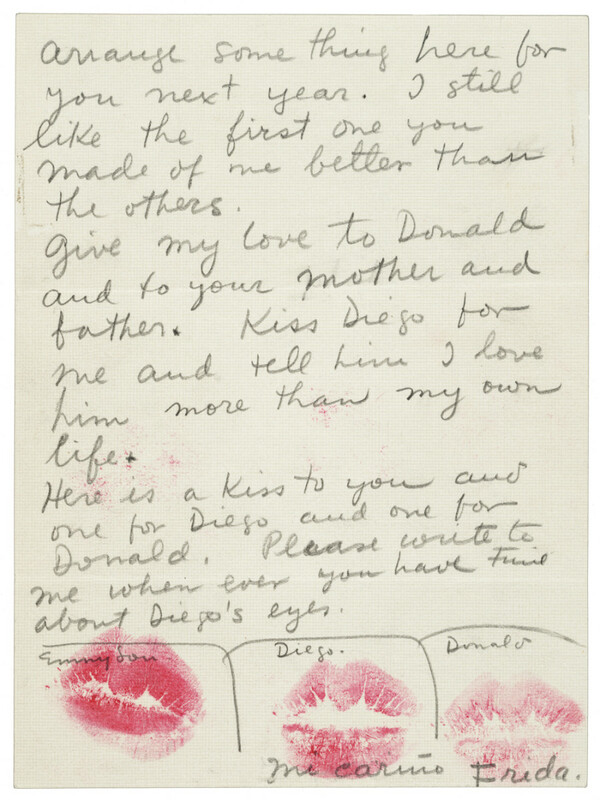 She closes the note, "Kiss Diego for me and tell him I love him more than my own life," sealing the heartfelt message with red lipstick kisses -- one for Diego, one for Emmy Lou, and one for her son. Kahlo and Rivera remarried soon after the exchange. 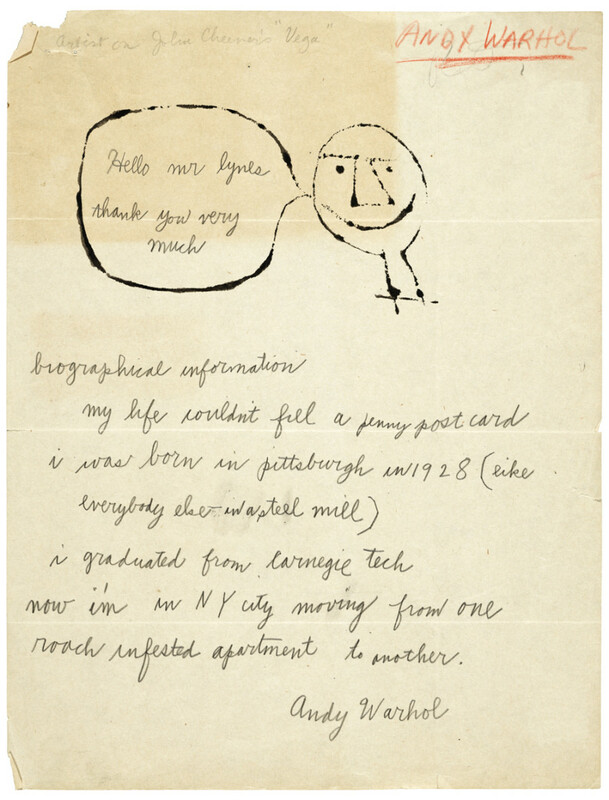 And then there's Andy Warhol, whose 1949 handwritten letter to Russell Lynes is as full of deadpan humor and creepy-cool doodles as we could have hoped. "I graduated from Carnegie Tech and now I'm in NY city moving from one roach infested apartment to another," he writes. Warhol's letter reaffirms what we've always suspected: this artist would have had a great Twitter. "Illustrated letters are inspired communications," Kirwin writes in the introduction. "They have the power to transport the reader to another place and time -- to recreate the sights, sounds, attitudes and imagination of the author." We have to agree. In an age when long distance communication is most often enacted via text, email or direct message, we have to admit there's something almost magical about ripping open a personal envelope that's flown across the country, holding within it a tiny art piece designed just for you. Basically, if you've ever dreamt of being Frida Kahlo's pen pal -- no judgment, we definitely have -- this is probably your best shot. Books are available from Princeton Architectural Press and Amazon, and, in the meantime, check out excerpts from the book below. All letters are from the Archives of American Art, Smithsonian Institution, and appear in More Than Words by Liza Kirwin. 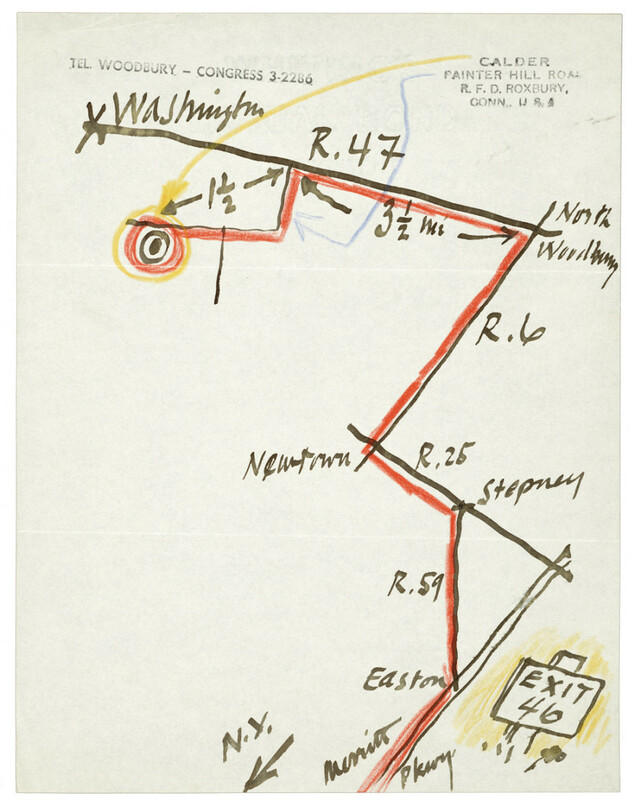 For more information about the archives, visit aaa.si.edu.